If you have any immediate problems with the telescope, instrument, or computers, please contact the 3-m telescope technician directly at 8-0652. If the problem isn't urgent or can't be resolved at the time you may report it via the Trouble Report software. typing trouble in an xterm window. When the software is started two windows will appear (see Figures 1 and 2). 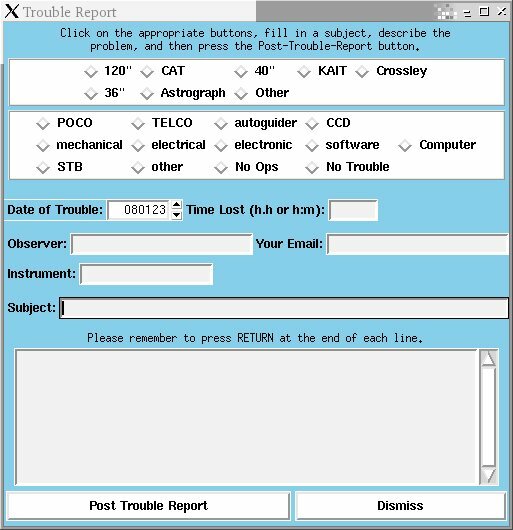 The Main Window (Figure 1) allows you to submit a report other than a trouble report, such as a Suggestion. Please enter your name in the entry box before submitting any report. The Detail Window (Figure 2) allows you to fill in the details of the problem. Please indicate which telescope you are using in the top section and the clasification of the problem (if unsure, just make your best guess) in the second section. Fill out the rest of the form as completely as possible, including as many details (including what time, if possible) of the problem as possible. Details about what you were doing immediately before the problem and any error messages at the time can be helpful to the technical staff when diagnosing and fixing the problem. When done reporting the difficulty, click the Post Trouble Report button.